｢Fresh Off the Boat｣ debuted on ABC in 2015, making it the first American television show about an Asian-American family in 20 years. I struggled to process that fact. I wasn’t even alive the last time there was a show on television about people who looked like me. Obviously, representation isn’t perfect, but Hollywood has made considerable progress since 1994, when Margaret Cho’s ｢All-American Girl｣ held this distinction. It’s easy to look at these obstacles and just want to give up. On rare occasions, we get a character like Hikaru Sulu from the ｢Star Trek｣ reboot, who shatters boundaries as a strong, gay Asian character and lives to fight another day. But often, it feels like each new issue is just a rehash of an old problem. We fight the same battles over and over again. Films have repeatedly erased Asian characters in a series of casting decisions that feature combinations of whitewashing and modern-day yellowface. Emma Stone starred as a Chinese-Hawaiian character in ｢Aloha｣, and the ｢Ghost in the Shell｣ production commissioned visual effects tests to make white background actors look Asian. Incredible Asian-American characters, like Cristina Yang from ｢Grey’s Anatomy｣ and Glenn Rhee from ｢The Walking Dead｣ have disappeared, having been either written off or killed, leaving a gaping void in representation. 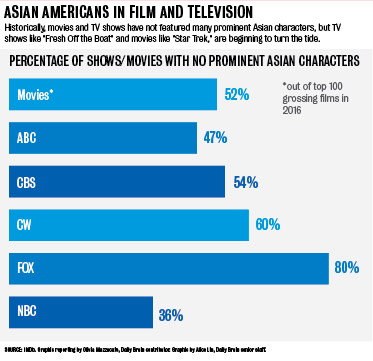 Many Asian characters that remain on screen are problematic stereotypes. Raj Koothrappali of ｢The Big Bang Theory｣ is awkward and unable to talk to women. Katana from ｢Suicide Squad｣ wears a mask with the Japanese flag on it, speaks sparingly and is named after the Japanese sword she carries. In response to the backlash following Scarlett Johansson’s casting in ｢Ghost in the Shell｣, screenwriter Max Landis posted a video on YouTube titled ｢If You’re Mad About ‘Ghost In The Shell’ You Don’t Know How The Movie Industry Works｣ and claimed that there simply weren’t any A-list Asian celebrities that could have taken the role. Writer Aaron Sorkin made similar statements, complaining that it was difficult to adapt a particular book because there aren’t any Asian movie stars. Reading Sorkin’s comments particularly stung because I’ve seen his ability to craft compelling characters in ｢The West Wing｣, to write roles that propel actors and actresses to fame. He has the credibility and the power within Hollywood, as a writer and as a creator, to elevate Asian actors and actresses. And maybe someday, ｢Fresh Off the Boat｣ won’t be the only TV show about Asian-Americans. Maybe then, my roommate and I won’t have to struggle to name Asian characters.